Android Antivirus applications are often bundled with useless features such as junk file cleaner, RAM booster, video/photo vault, etc. Moreover, they also have in-app purchases for buying utilities which users don’t need. 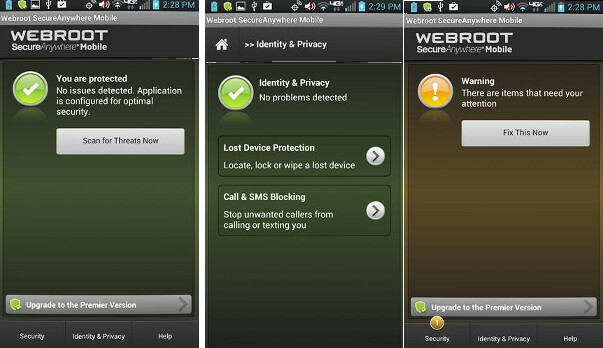 If you’re looking for a mobile security app that doesn’t have annoyances, you should try out Webroot SecureAnywhere. Webroot is a free app with in-app purchases. It has eight powerful features and an option to upgrade the app from free version to premium. The in-app purchase costs $15. SecureAnywhere checks whether your device is rooted or not. If it is rooted, Webroot will display an alert message. You can ignore this message and start using the app. WebRoot displays the protection status on the notification bar. To turn off this feature, open General Settings and uncheck the “Persistent Status” option. Install shield: When this shield is active, Webroot will scan APK files you download from a third-party website. It also scans apps you install from the Play Store. File System shield: When a file is modified, Webroot will scan it immediately to make sure that the system is safe. Dialer shield: Some websites mislead people. For example, a website may have many buttons. If you tap on one of the buttons, the page will open an advertisement or dial a number. Webroot won’t block ads, but it can block pages from dialing a number. To use this feature, you must enable the Dialer Shield of WebRoot. Scheduling: Webroot lets users schedule hourly, daily, and weekly scans. The app displays the last scan time. It also displays the shields that are on or off. Quarantine: Files that Webroot finds malicious are sent to the Quarantine folder. You can delete the Quarantined items in the Webroot SecureAnywhere app. When this feature is active, Webroot will scan the website code before the browser executes it. If the code is suspicious or harmful, the WebRoot SecureAnywhere will block the website. If your device is compatible with this app, you can add website addresses to the ignore list. Call and SMS blocking: This feature allows users to configure Call/SMS blacklist i.e. Webroot lets you block direct messages and incoming calls from specific numbers. WR can detect and delete malicious messages automatically. It can also block calls from unidentified numbers. To see what numbers/messages WebRoot has blocked, tap on the “Block Log” option. If you need a sophisticated call blocker, install a reverse phone lookup app on your device. The SecureAnywhere app consumed 2.5 megabytes RAM and 18.06 megabytes storage memory on my device. When it is running or scanning files, it has no effect on the performance of other Android applications. Although the app has an ordinary interface that doesn’t employ flashy animations or icons, its features are amazing. Also, the app lacks annoying features that are not related to phone security i.e. junk cleaner, duplicate file finder, etc. Webroot is one of the top security companies in the world. Hence, you can trust its SecureAnywhere app’s antivirus engine. What did I like about this app? Although Webroot doesn't have a great user-interface, its features are powerful. It lacks utilities that are not related to privacy or security of the user.